After the satiny gleam of the look based on Chanel Rouge Coco in Taffetas Rose, I thought it might be nice to imagine a look for day. I’m sort of thinking of the lipstick pressed into the lips as a stain, with a smidge of shimmery brownish gray contouring the socket line, a touch of darker matte brownish gray smudged into the lash line, and a bit of pearly-white highlighter blended on the high points of the face. The intensity of the lip could easily be dialed up for more of an evening look, although full-on red lips are obviously totally appropriate for day. It all depends on comfort level, and so much is in the execution and balance of all the features. As I mentioned in previous posts, although I think it would be fantastic to be able to curl my eyelashes, whip on some black mascara, swipe on my cherry-red lippie and run out the door, I personally prefer a little more definition around the eyes to keep things in balance. So in all of the looks that I’m proposing in this cherries-in-the-snow series, I’m including some eyeshadows that I think are especially nice to wear with a strong, very cool-toned red lip. OK, enough preamble! On to the pics! There are many, many rich, beautiful, cool cherry-reds out there to choose from, but Tom Ford Cherry Lush is mentioned so often as a nice example of the genre that I thought it would be fun to include it here. I keep my tube of Cherry Lush in the fridge (next to a tube of Black Orchid). You can (sort of) see in the pics (apologies for the blur!) that it is untouched. Why? Oh, it’s silly–mostly because I find Tom Ford lippies a little confounding. They seem to go bad on me within a few months of initial use. I can’t tell if I’ve had the bad luck to buy old stock or if something else is at work, but as much as I want to wear Cherry Lush, I also don’t want it to go bad! It’s a makeup Catch-22. Eventually I’ll just give up and use it, and resign myself to possibly having to buy another one in three or four months. Anyway, of the three looks I assembled based on the cherries-in-the-snow inspiration, this one is the least thrilling to me. (Perhaps that’s why I labeled it a day look!) I like all of these products very much, and I wouldn’t show them to you together if I didn’t feel that they really worked, but the other two looks (one still forthcoming) thrilled me more in a way. I think this is probably because I’ve never used my tube of Cherry Lush, so my sense of its specialness is sort of…attenuated. I feel distant from it. I swatched it heavily in the store when I bought it, of course, but it’s hard to feel really attached to an unused lippie that lives in the fridge. Slightly unfortunate packaging, highly useful shadows. From the left, Benefit Smokin’ Eyes Palette; Becca Shimmering Skin Perfector in Pearl; a slightly blurry Tom Ford Cherry lush (the shadows are my true love here). Anyway, if you can look past all that cluttery stuff to the shadows–those mid-tone and dark shadow shades are great to wear with blue-red or blue-pink lips. They each strike a really nice balance between warm brown and cool gray, which I feel is really essential for a snow-inspired look based on a vibrant, blue-red lip. The mid-tone shade is dark enough to contour the socket very effectively, even if used with a light hand. It’s easily built up (which helps with tweaking the balance of eyes versus lips/cheeks), and it’s nicely shimmery, so it doesn’t look heavy. The darker shade works very well as a soft liner. So, yeah, it seems a little weird, I know, with so much red-lippie goodness around, but these shadows are my real love in this look. I have to credit Lisa Eldridge for finding them and proposing them for this purpose–she used them to define her eyes and balance out a strong, berry-toned lip. I want to be sure to mention the highlighter, Becca Shimmering Skin Perfecter in Pearl–just an absolute workhorse in my stash. I remember when Becca used to be a bit hard to find in the States. 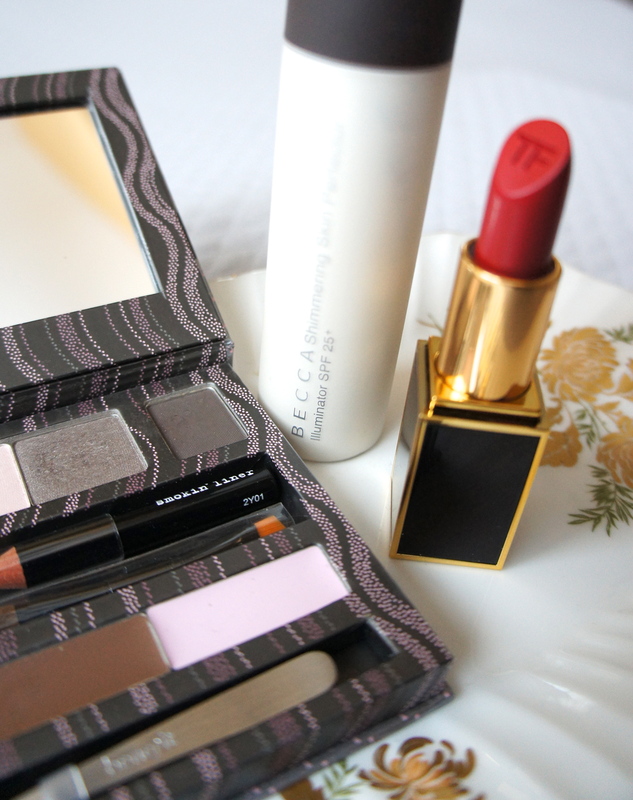 I would stock up on Becca cream blushes and SSP at the Sephora in Union Square (I think?) in San Francisco. Sigh. Good times. I was, in fact, so absorbed in digging up just the right snowy highlighters from my stash that I almost forgot about blushers! I went back to choose one that I thought would be nice for this look–a cream blusher that I bought specifically to wear with cool-toned reds, in fact. I would describe this shade as quite a warm, mid-tone pink. It’s warmer (I think?) than Chanel JC in Rose Initial, which I chose for the first look in this series. Because the highlighter in this look is much cooler than it was in the satiny evening look, I thought it might be a good idea to warm up the cheeks just a tad more, lest the whole face become overrun with cold tones. Warming up the (face!) cheeks. 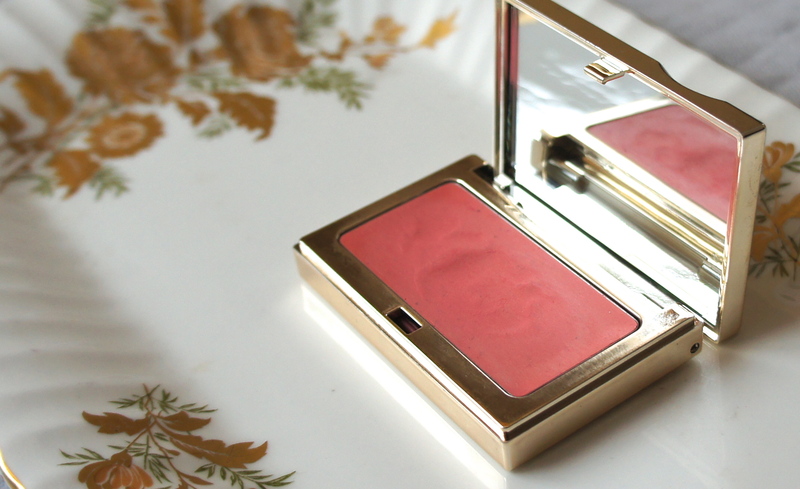 Clarins Multi-Blush in Candy. And that is the second look in the series. It doesn’t speak to my heart quite as much as the cherries-in-the-snow-inspired satiny evening look, but it seems solid, even useful…as grounded as a look inspired by such a fanciful idea can be. For the third and final cherries-in-the-snow-inspired look, I’m planning something a bit dressier again. Thank you for looking, and I wish you all the very best!